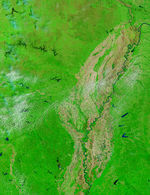 This series of images from the Moderate Resolution Imaging Spectroradiometer (MODIS) on the Terra and Aqua satellites in mid-July 2003 shows fire activity in Utah. 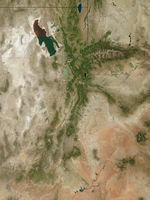 Over the period, several small fires reach detectable levels and then subside. 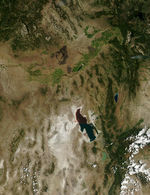 For example, the Farmington Fire east of the Great Salt Lake is visible on July 11, but not on July 12. 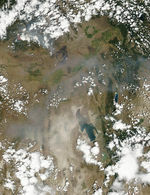 By July 13, a small fire has been detected south of the lake, but that fire was not detected again in the imagery from July 14. 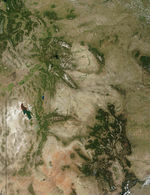 Toward the south of the images, however, the large Bulldog Fire on the Colorado Plateau remained active throughout the time period. All active fire detections are marked with red dots or outlines in these images.